You Were Hot Last Summer: Last summer might seem far away, but take a moment to think back, did you have any problems staying cool? Your air conditioner should be equipped to keep you’re the sweat off your brow all summer long. If you’re sweltering in your home then it’s time for you to call our professional air conditioning technicians. We’re a conscientious team that understands how to service your home. Your Home Is Too Humid: If you’ve lived in Texas for any amount of time, you’re no stranger to humidity. If there’s one place that you should be able to find solace, it’s in your home! If you’re feeling hot and sticky in your house, make sure that you contact our professional team today. Humidity problems can quickly lead to issues with mold and mildew which are a real threat to your health. We can make sure that your air quality is high, and your humidity levels are low. Your AC Bills Are Too High: If you open up your AC bill and wince in pain at the price, it’s time to call our air conditioning experts here at PRK Services, Inc. When you have an air conditioning system that’s been poorly maintained or one that’s just out of date, it’s time to have a professional bring your system back up to par. 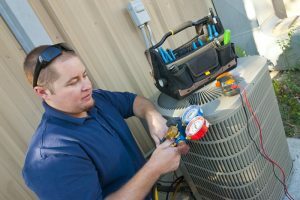 We’re the best in HVAC here in Denton, Flower Mound, and Corinth. We’re committed to providing you with the best service possible, so we work hard to stay at the forefront of the ever-evolving HVAC industry. It gets hot here in Texas, so when you need great service, you need a team that’s responsible, caring, and personal. We’re a family-owned and operated business so we go the extra mile to treat our customers like family. You’ll never have to worry about getting one-size-fits-all service with our conscientious team. We’re rounding out winter so it’s time to start thinking about your air conditioning services. If you’re ready to service your AC, make sure that you contact PRK Services Inc. to schedule an appointment today!